HfS Research and SIG are partnering to deliver global research and insight and develop a portfolio of initiatives to benefit members and subscribers alike. Through our partnership, SIG members can access HfS Premium Research, including the cornerstone Blueprint reports. SIG members are also entitled to a 30 minute complimentary call with an HfS analyst. If you are interested in setting up this call, please reach out to sig@hfsresearch.com. HfS Blueprints are the cornerstone of HfS research. Blueprint Reports and Blueprint Snapshots have emerged as highly influential guides and key decision making tools that help buyers and consultants choose technology and service providers wisely. 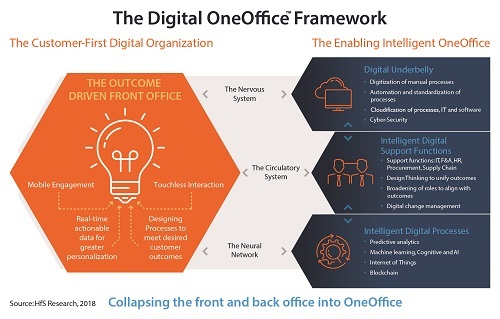 HfS Research publishes Blueprint reports across a broad range of topics on all aspects of the Intelligent OneOffice™. Each Blueprint covers trends and themes on the combinations of talent and technology for business outcomes, market activity, service provider analysis and recommendations to buyers and providers for business outcome-oriented engagement...an “outside in” point of view on competitive positioning and differentiation. Blueprints also describe the journey of a specific market toward the As-a-Service Economy. HfS Research analyzes the market across the eight ideals of the As-a-Service Economy to describe the use of talent and technology in a more agile and impactful way. The OneOffice and As-a-Service ideals are the fundamental basis of Blueprints, providing an emerging view of the market that is not just unique but also impactful. For the full overview and more details, please visit www.hfsevents.com. "SIG is thrilled to be partnering with HfS Research. Not only are we providing our members with world-class research, but any member company employee can access HfS Research analysts, which is an incredible value and benefit." For more information or to benefit from this offer, reach out to sig@hfsresearch.com.